Last week my daughter, half Scottish, and I went to see James McAvoy’s latest West End theatre performance in ‘The Ruling Class’. I read in the programme that Mr McAvoy had appeared in ‘Breathing Corpses’ at the Royal Court in March 2005, but my daughter was still in primary school and so we missed seeing this ‘exciting young talent’ (that’s a quote from the time by the theatre critic of The Independent). However, since then we have been lucky enough to see him star in ‘Three Days of Rain’ (2009) and then terrify us as ‘MacBeth’ (2013). 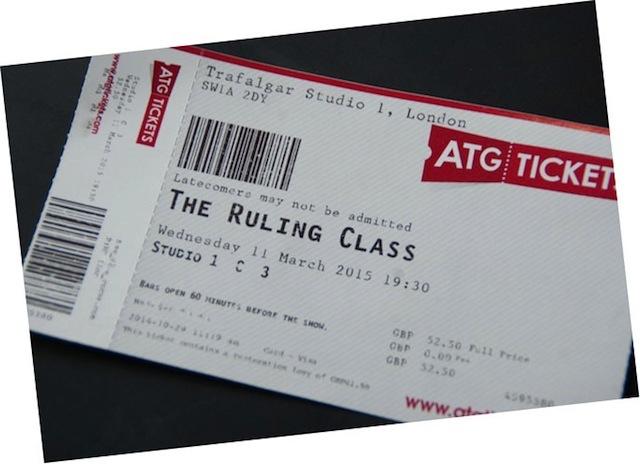 And now, we have enjoyed watching him lead a strong cast through the revival of the 1968 satirical play ‘The Ruling Class’ by Peter Barnes. 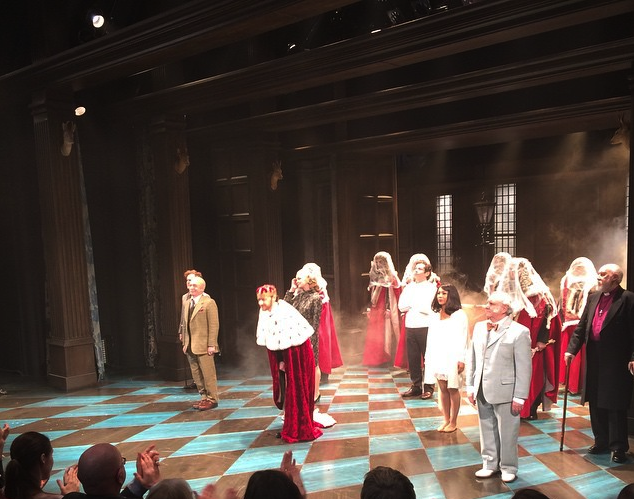 Superb ensemble headed by James McAvoy taking their bows at the end of ‘The Ruling Class’. The play has not been given a 21st-century updating, but deliberately offers us the looks and, more importantly, the voices of the 1960s, all strangled received pronunciation (aka the Queen’s English or BBC English). Although I’m not old enough to remember the class politics of the late 1960s, I did recognise and understand the overall context and its resonance for a 2015 audience. As a piece essentially poking fun at the British class system I wondered what many of the younger, overseas visitors made of the play. I was sat between my daughter (21) and a lady who I think had seen the original 1968 production. I think the older lady and I enjoyed the whole experience considerably more than my daughter. Electrifying – Forbes Masson and James McAvoy. ‘The Ruling Class’ publicity photograph by Johan Persson. James McAvoy’s performance as Jack, the 14th Earl of Gurney, grabs the audience round the neck and shakes it this way and that as he energetically channels his immense charisma into this larger than life character. 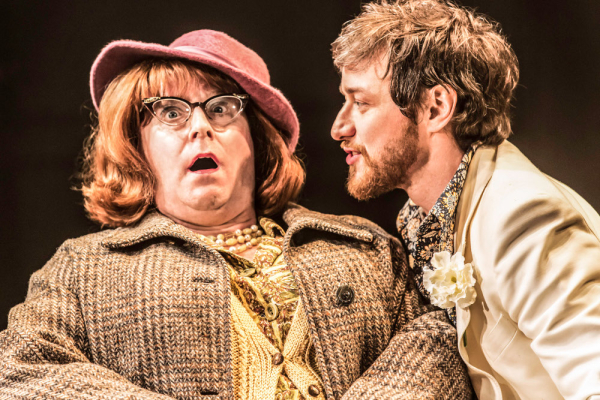 The play is funny, the humour dark and vicious, and McAvoy appears to relish playing such an unstable, fluid character. It is no wonder he has been nominated for a Best Actor Olivier Award. Almost equalling McAvoy’s mesmerising performance is another Scot, Forbes Masson, who was both versatile and brilliant in the various parts he played. Indeed, the whole talented cast made for a highly entertaining evening particularly if you enjoy a dose of black humour. The play is on until April 11, 2015 at Trafalgar Studios. And, finally, if you would like a straight from the horse’s mouth comment on the current controversy about elitism in theatre – have a look at this two minute video filmed at the opening night.